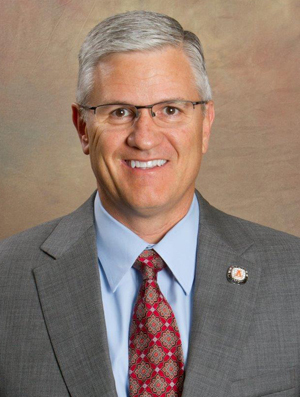 The New Mexico Coalition of Educational Leaders (NMCEL) and New Mexico School Superintendents’ Association (NMSSA) have named Artesia Public Schools Superintendent Dr. Crit Caton as Superintendent of the Year. The award was presented Friday, the final day of the NMCEL’s annual statewide conference for New Mexico school and district leaders at Embassy Suites in Albuquerque. The organizations praised Caton’s efforts to foster meaningful communication between the Public Education Department, New Mexico Secretary of Education Hanna Skandera, and educational practitioners. “Dr. Caton’s most impressive attributes include his communication skills, his insight and professionalism, and his passion for public education,” the NMCEL states. “Many of his colleagues rely on him not only for his opinion on education but also for his moral beliefs. Caton additionally serves as one of two members representing New Mexico on the American Association of School Administrators (AASA) Governing Board and the governing board of the New Mexico Activities Association (NMAA). “I’d like to thank the NMSSA and the NMCEL,” Caton said during his acceptance speech. “I’m extremely honored and humbled by your recognition. Please join me in understanding it’s not about me, it’s about we. Caton, who will represent New Mexico at the AASA Conference in March in New Orleans, La., told the Daily Press Friday he feels “very fortunate” to be in Artesia and work for a school system that has the full support of the community and the Board of Education.